Looking east toward the Chimney Hollow Reservoir site, which is just this side of the red ridge. On the other side is Carter Lake Reservoir and beyond that, the Loveland area. Northern Water and the Municipal Subdistrict have launched a revamped website to provide easy-to-find data regarding the Windy Gap Firming Project and its chief component, Chimney Hollow Reservoir. The site, http://chimneyhollow.org, offers answers to frequently asked questions, information for potential contractors and download-ready fact sheets. In addition, it offers a video from Gov. John Hickenlooper that discusses his endorsement of the project as well as its place in the the Colorado Water Plan. 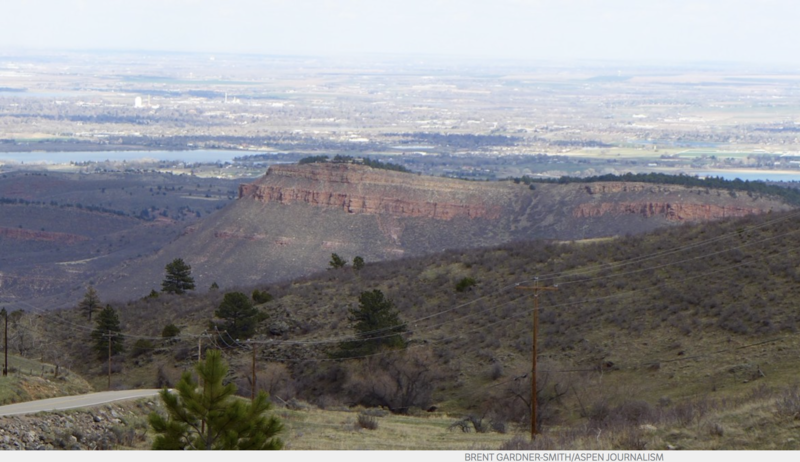 As the project moves forward, the site will also present information related to the construction of Chimney Hollow Reservoir as well as the mitigation and enhancement efforts being conducted by Northern Water’s Municipal Subdistrict. The project also has a presence on Facebook, found here.